CIRCOR Aerospace was selected by Triumph Actuation Systems to supply the Landing Gear Emergency Blow-Down System for the Sikorsky CH-53K Helicopter through its Aerodyne Controls brand. CIRCOR Aerospace will design, develop, and manufacture the landing gear blow down system from the Ronkonkoma, NY facility. In the event of hydraulic power loss, the CIRCOR Aerospace landing gear emergency blow-down system provides pneumatic power to the Triumph actuators which extend the landing gear. Aerodyne will provide an integrated unit which includes all necessary valves, gauge and nitrogen storage bottle in a small manifold mounted on the actuator. The system’s light weight and compact size were major factors in the award. “CIRCOR Aerospace/Aerodyne Controls welcomes the opportunity to work with Triumph Actuation Systems on this safety-critical application,” said Christopher Celtruda, Group Vice President for CIRCOR Aerospace Products. 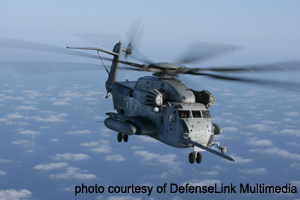 The CH-53K Landing Gear Emergency Blow-down System will be designed and manufactured at the CIRCOR Aerospace/Aerodyne Controls business unit location in Ronkonkoma, NY. CIRCOR Aerospace, Inc. (CAI) is a CIRCOR Aerospace company headquartered in Corona, California, and is focused on the design, development, and manufacture of specialty fluidic control and actuation systems, and aircraft landing gear systems for demanding aerospace and defense applications. CAI provides a full range of check, relief, and electro-mechanically actuated valves, actuation systems, manifold assemblies, and complete landing gear systems. Aerodyne Controls, a CIRCOR Aerospace, Inc. company, designs and manufactures high-quality pneumatic control systems, precision switches and inflation systems for the aerospace, defense, and space markets.